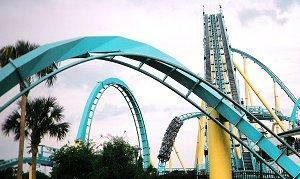 Kraken at Sea World Orlando. The trio of Sea World parks (Orlando, San Diego, and San Antonio) are great family attractions, but they can also be expensive - discount Sea World tickets, however, are a great way to cut prices without cutting any fun. There are many ways interested park guests can find discounts, regardless of whether they are planning their Sea World vacation well in advance or are already at the park and ready to buy their tickets. Residential discounts for in-state or local visitors. Senior citizen discounts or special rates on certain days. Direct discounts on daily admission for purchasing tickets online or more than a week in advance. Season passes that offer significant savings for frequent guests and may include other benefits such as restaurant and gift shop discounts, free parking, or discounts for additional guests. Combination tickets with other local parks, such as the San Diego Zoo and Universal Studios Hollywood in California or Universal Studios Florida, Busch Gardens, or Islands of Adventure in Florida. Group discounts for birthday parties, family reunions, or large extended families. These types of discounts are easy to take advantage of and can offer substantial savings for Sea World visitors, but they are not the only way to cut a few dollars from admission prices. There are many online ticket brokers who are licensed to sell discounted tickets because they purchase the tickets in bulk. They are not always able to offer every type of ticket, however, and the savings range from just $1 to over $10 per ticket depending on which park it is for, when it is purchased, and what the initial gate price would be. When buying discount Sea World tickets from online dealers, visitors should take care to investigate the retailer's authenticity and compare prices to be sure it is a good deal. Shipping charges, transaction fees, and other charges could actually make these discount tickets more expensive in the end. Save by buying tickets online. Before buying tickets from online retailers, eager park guests should verify which park the tickets are valid at and whether or not there are any expiration or blackout dates. It is also important to know how to pick the tickets up - will they be mailed, printed, or held at a specific location? Fine print can turn a discount ticket into an expensive mistake. Many theme parks, including Sea World, also offer special discount promotions. Partnerships with popular soft drink or snack food companies may lead to discounts if guests bring a specially marked can or wrapper with them when purchasing tickets, or local retailers may have coupons available. Parks may also offer special promotions and discount tickets when the park is naturally less crowded (during the fall and winter, for example). Buyers really interested in a heavy discount can opt for riskier ventures, such as finding tickets through eBay or other online auction sites. While this could be a great bargain, buyers need to take extra precautions to ensure they are not buying a counterfeit, expired, or used ticket. With admission prices (subject to change) for Sea World ranging from $55 in San Antonio to $65 in San Diego to $75 in Orlando, saving even a few dollars can help guests enjoy the park without being drowned by a whale of a price. Saving a total of $10 may permit a family to enjoy extra snacks or purchase fish and treats to feed dolphins, stingrays, or sea lions, turning a small discount into a big vacation thrill. Discount Sea World tickets are not difficult to find, but before reeling in the first available deal, prospective visitors should ensure the discount will apply to the specific park and type of tickets they are interested in. With some savvy shopping, a minnow of a deal can create a tidal wave of savings.